Judas Priest or Judas Tap? Judas Priest are heavy metal gods - of that there can be no doubt. But even gods fall, and the Priest's appearance on Jimmy Kimmel's TV show from Hollywood two night ago still has us scratching our heads. Performing the song Prophecy from their two-disc concept album Nostradamus, Judas Priest seemed at times to be in almost a Spinal Tapian mode. The unison stage moves, the deadly serious upraised guitars, the quasi-cosmic lyrics - all that was missing was a minature Stonehenge. And what to make of Rob Halford? 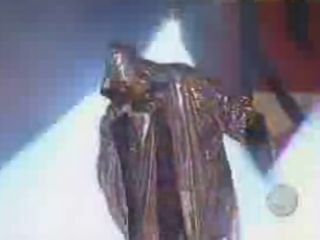 Usually hell bent for leather, the singer was cloaked in some sort of foil-wrapped Father Time hooded robe. Was he trying to go for an Afrika Bambaataa vibe? If so, he succeeded brilliantly. We must say, it was highly entertaining in a Should-I-be-liking-this-or-not? manner. What say you? Rockin' performance or bizarre performance art? Here's the video. Let us know what you think.